I’m nearing the end of my analysis of a few popular packaged, junk foods. I sincerely hope that these posts helped you familiarize a little bit on the ingredients and additives used in such foods. One more post coming up later this week, after which I’m done with this project. In my earlier post, I mentioned that there are a few junk foods that are on top of my “hate” list. 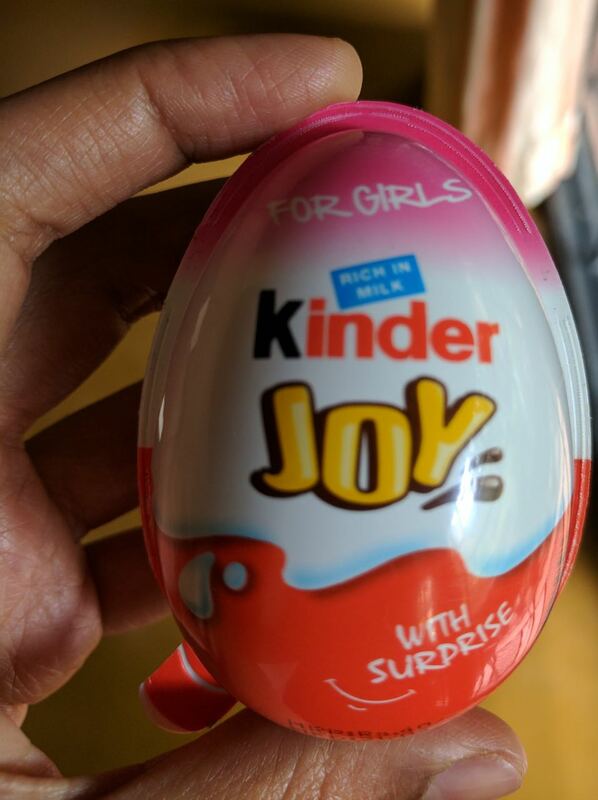 One such kids’ favourite treat is this egg shaped Kinder Joy. 1. The sheer amount of waste that this product generates. The two outer shells with individual wraps, a plastic spoon, couple of instruction papers/stickers and plastic toys/knick-knacks. The child is excited about the toy for a few seconds, after which it ends up in the garbage bin. How ridiculous this concept is! How much of plastic waste is thrown! Atrocious is the word. 2. The gender prejudice the toy advocates. I’m a mother of a daughter. Even if I choose to overlook the pink/blue packaging differentiation, the toy inside is unbearable. Boys get vehicles/blocks etc while girls get pendants/rings/bracelets with pictures of dolls. Don’t girls have anything better to do other than wear these knick-knacks or play with dolls? What sort of messages are we sending to our girls AND boys? Heights of idiocy! 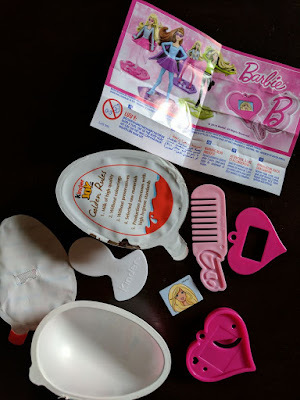 I had to buy this junk to show the EXACT stuff inside a "for girls" pack. And while you are at it, do take a look at the amount of waste generated. In simple terms, each Kinder Joy contains a whopping 2.5 tsp of sugar and around 1.38 tsp of fat. Do we even need to worry about the rest of the ingredients, given that the high amounts of sugar and fat is a big enough concern? It has the same ingredients profile like any other junk foods - wheat flour (maida), lecithin, raising agents etc. The price point is Rs.40 - for what? If you are affected by even one of these three issues, then let’s stop buying and supporting such products. Kids will understand, if we sit down and explain to them. Is the carb AMT per 20g correct? The numbers don't add up.